The Custard TV: That Day We Sang: Victoria Wood provides a wonderful musical treat for the festive season. 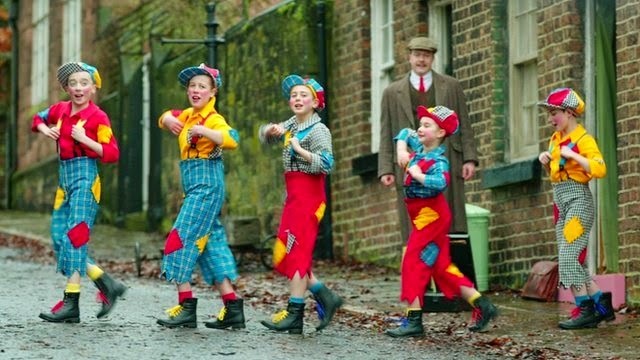 That Day We Sang: Victoria Wood provides a wonderful musical treat for the festive season. A few weeks ago I found myself in a small screening room in London with two people chatting behind me after the film had begun. Normally this sort of thing would bother me but as the two people were Victoria Wood and Michael Ball I thought I'd let it go. The screening was for That Day we Sang; a one off musical confection written and directed by Wood and starring Ball in the lead role. Described by Wood as 'Moulin Rouge in Slippers'; Ball plays Jimmy 'Tubby' Baker a loser in love who, in 1969, is reunited with the childhood companions who he performed alongside as part of the Manchester's Children's Choir. The reunion is part of a documentary celebrating the famous recording the choir made of 'Nymphs and Shepherds' alongside the Halle Orchestra. Part of Wood's inspiration for creating the musical, which was first staged as part of the Manchester festival, was a similar documentary she remembers watching in her youth. Out of that inspiration came the idea for two middle-aged characters who hadn't really acted on the potential of being part of the choir. 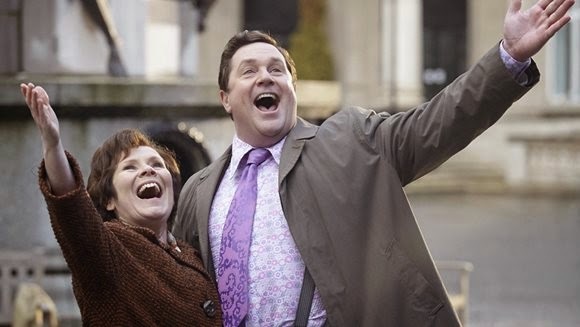 Ball's Tubby is presented as a loser-in-love who has spent the majority of his adult years caring for his mother and as a result has never found a partner. 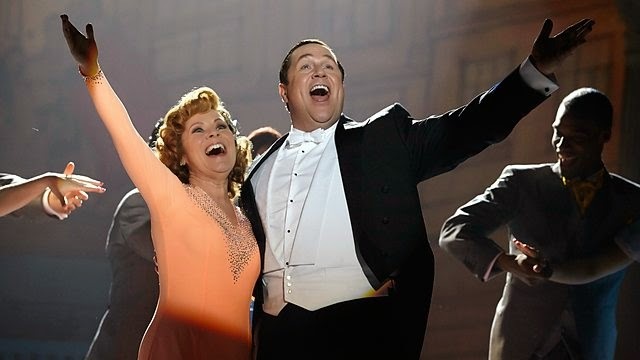 Meanwhile the musical's other main character; Imelda Staunton's Enid has been similarly stuck in a rut and has been conducting a long-term affair with her married boss. Wood almost immediately makes us care about Tubby and Enid as both are likeable, slightly meek characters who most of us can identify with in some way. Even if you weren't aware that the piece had been written by Wood the lines that both Tubby and Enid utter could easily have come from the comedienne's earlier work. Tubby's tendency to over-vinegar his chips and Enid's diet of plain yoghurt are just two of the little intricacies that make That Day We Sang a quintessentially Victoria Wood piece. As the 1969 scenes progress what we are given is a very sweet-natured love story with characters we are willing to be together. Running alongside the Tubby and Enid plot is that of the former's participation in the recording and his relationship with his mother. Of the two timelines, I found that the 1929 scenes had a bit more grit to them as the audience slowly realised why it was that the young Jimmy's mother hated music. These scenes also followed the young Jimmy's (Harvey Chaisty) relationship with Methodist choir assistant Mr Kirby (Daniel Rigby). Initially presented as a frosty character, partly due to his time in World War One where he lost a leg, Kirby softens as he becomes somewhat of a father figure to Jimmy. The relationship between the pair culminates in a scene that demonstrates just how Jimmy got to sing on the record. It also interlinks with the present day in which Kirby comes to Tubby's aid once again as he tries to woo Enid. I feel that some people will be put off by the musical element of That Day We Sang and indeed the songs are a vital part of the narrative. Just like the dialogue, the majority of the musical numbers are ones that can you envision Wood performing herself. From an ode to Bernie Inns to a fantasy sequence that sees Tubby and Enid become Fred and Ginger; Wood combines her trademark humour with a number of fantasy sequences. My personal favourites were Enid's song about her name and an early song which is performed by both Tubby and the young Jimmy as they voice their need to make their mother proud. However I did find that at some points Wood went a little overboard with the musical numbers and felt that at least one of them could've been replace with standard dialogue. Despite this I was wrapped up in the story almost from the get-go thanks to Wood's scripting and the performances from the lead actors. Indeed Ball and Staunton are perfectly cast as these two likeable losers-in-love who find each other after forty years. Capitalising on their chemistry in Sweeney Todd; both leads are utterly beguiling and share a natural presence when they are around each other. Particular praise must go to Ball, in his first leading role in a TV programme, as I found he perfectly captured both Tubby's down-to-Earth nature and his inner-sadness over never finding anyone to share his life with. Meanwhile Staunton, who was described as a 'pocket rocket' by Wood, is utterly brilliant and seems to relish Enid's two fantasy sequences. Elsewhere Daniel Rigby steals a couple of scenes as the ultra-religious Kirby whilst I really enjoyed the performance given by Lyndsey Marshal as Jimmy's mother. But at the centre of the piece is Wood who has provided the Christmas treat that she set out to produce. Her love of her characters is evident throughout That Day we Sang and as a result its impossible not to like the show. While I didn't enjoy every element of the musical I found the performances and the production design to be superb. As Wood's characters are utterly likeable the final number got me rather emotional and I found my eyes beginning to get moist. Furthermore I think that you'd have to be particularly stony-hearted not to at least break into a smile during the final sequence which sees Tubby and Enid finally unite. For more of my views on TV please follow me @mattstvbites on Twitter.